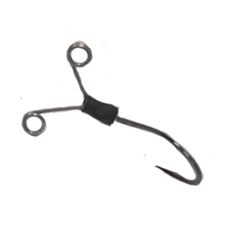 Lake Fork's Frog Tail hook is an innovative trailer hook for soft body frog rigs. The strong Gamakatsu wide gap hook still keeps your frog virtually weedless and allows unhindered motion. The design slips on to most double-hook frogs, and increase hookups by catching short strikes.